Washington D.C. is buzzing with Neuroscience. Hotels are full with Neuroscientists, restaurants are fully booked with them so if you do not make reservations in advance there is no way you can find a seat. And they all wear the same conference badge. 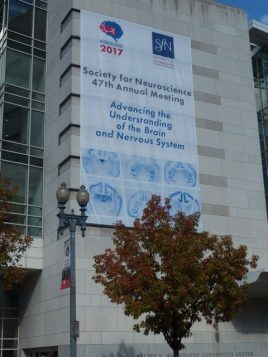 From November 11 – 15 the 47th annual meeting of the Society for Neuroscience 2017 is held in Washington D.C, with around 30.000 attendants. Medical Neuroscience is well represented at the meeting. Professor White is there as he has done for more than 30 years. Professor White has invited me to come so I’m part of this exciting hive of neuroscience. I can go to the meetings lectures, symposia, workshops, meetings events and socials. It is wonderful and I’m really enjoying it as much as I can. The only drawback is that you have to make choices all the time on where to go and what to skip. There is so much going on that it is impossible to go to all the lectures, posters and events that you would really like to see. Dipping into the scientific world of Neuroscience is wonderful and stimulating. For me the workshop “Evidence-Based Approaches to Teaching Neuroscience” was especially stimulating and enriching. 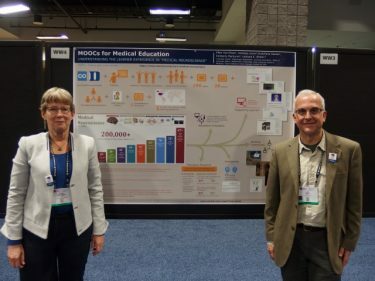 There aso has been a poster presentation by us called: and we have had good questions and interested viewers. 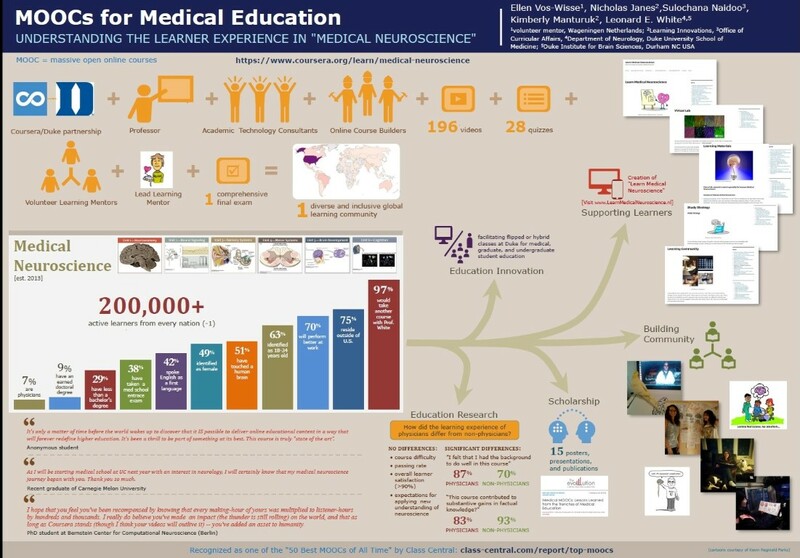 The poster is a rich overview of the Medical Neuroscience course. It gives information on what it takes to make a course like that. It gives an idea on the content of the course. The poster has also rich data on the learning community of the course and the mentor team. 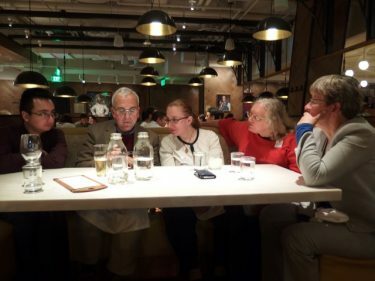 A group of Medical Neuroscience addicts (consisting of Iva Aleksova, Leslie Sussan, Guillermo Coronas and Ellen Vos) also met with professor White for an informal get together in Washington D.C. and had a wonderful time together. Meeting fellow learners that you only know digitally is a wonderful experience and we should try to do it more often.